When ever you purchase a camera from Spencer's Camera & Photo rest assured your camera is covered by our in-house warranty. Our warranty covers the entire camera for 1 full year for new cameras, and 6 months for used cameras. It covers any failure not caused by, shipping damage, misuse, or abuse. Obviously, if you drop your camera in a lake we won't cover that. If you shutter fails, we'll repair it at no charge to you. If you sent us a camera for modification we warranty the modification service for 1 year. This includes focus calibration and workmanship related to filter installation services. If you have a problem with your camera contact us and we'll help keep the process as painless as possible. Then, simply send the camera to us with a detailed description of the problem; we'll quickly diagnose the issue and cause of the malfunction, then provide a repair timeline. 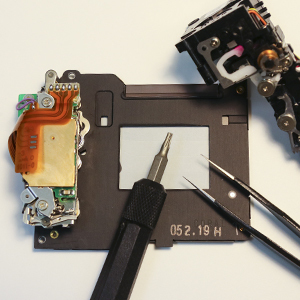 If the camera has been misused or abused we can still repair it and, in most cases, will provide a discounted repair rate.